The MCP6S91/2/3 are analog Programmable Gain Amplifiers (PGAs). They can be configured for gains from +1 V/V to +32 V/V and the input multiplexer can select one of up to two channels through a SPI port. The serial interface can also put the PGA into shutdown to conserve power. These PGAs are optimized for high-speed, low offset voltage and single-supply operation with rail-to-rail input and output capability. These specifications support single supply applications needing flexible performance or multiple inputs. Use the MCP6S22 PGA PICtail™ Demo Board to evaluate and demonstrate Microchip Technology’s MCP6S21/2/6/8 Programmable and MCP6S91/2/3 Gain Amplifier (PGA) families. The MCP6S2X PGA Evaluation Board (Rev. 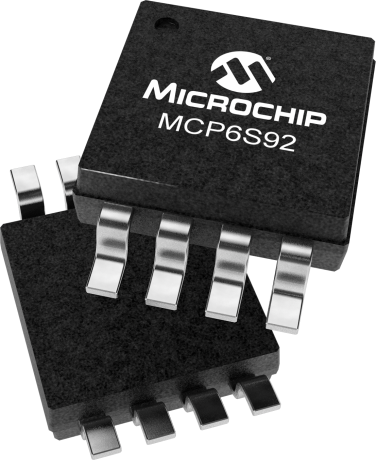 4) features the MCP6S21/91 and MCP6S26 devices. The PGA devices interface to a PIC16F676 providing versatile selection of input channels and gains to evaluate device performance. The board supports multiple input signal sources and two devices are cascaded to produce a gain between 1 V/V and 1024 V/V.